No more than 16 Different Colored FF&F .ssk Skins in Skins folder. Minimal time to New-Stickie, Set-skin, Edit, Configure, Manage, etc. Optimal number of FF&F Skins. 개 그 이상 아닌스킨 폴더에는 16 FF&F ssk 스킨. AdF.ly가 팝업되면 오른쪽 상단을보고 5 초 이상 기다린 다음 'SKIP AD'을 선택하십시오. 2 DropBox에서 파일 이름 아래의 'DOWNLOAD'버튼이 나타날 때까지 기다리십시오. 2. Un-Zip 'fffsuite1, 2, 3.zip', (As Applicable) copy all applicable files to above created directory. 3. Right-click the "Task-bar/Stickies-Icon/Options/Appearance/Preview/Skin details/Skin..."
4. In 'Skin chooser' select 'Browse' and select above created directory/OK, the 16 FF&F Skins (See FF&F INTENDED APPLICATION above) should appear in the 'Skin chooser'. 5. Select a Skin to be the 'Default Skin', a Dialog-Box should appear stating 'Would you also like to change your default style to match this skin? ', select 'Yes', then back in 'Options' select 'Apply skin now/OK'. DISREGARD THESE INSTRUCTIONS - if you HAVE NOT previously loaded FF&F ... 1A.ssk (1A) Skins in your default Stickie Skins access directory. Presuming you have previously loaded any 'FF&F ... 1A.ssk' Skins in your default Stickie Skins access directory you will need to reassign each '1A' Skin to FF&F ... 1.ssk, Dropping the 'A'. 2. 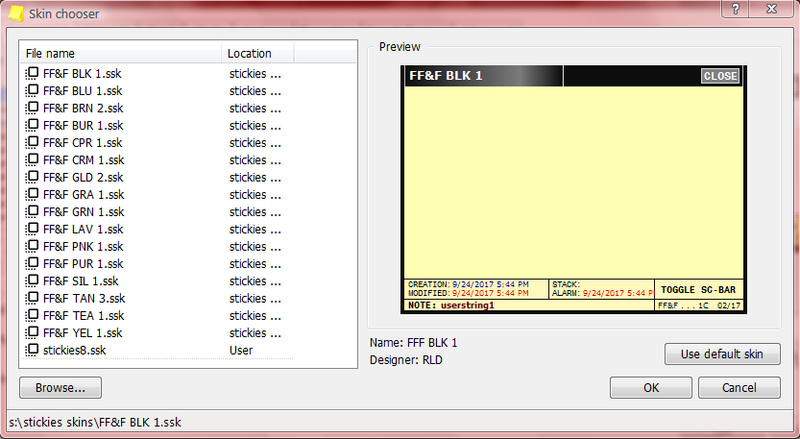 Delete all previously loaded 'FF&F ... 1A.ssk' Skins in the Stickie Skins access directory.